It’s August, and seemingly every village, town and city is having a fería or festival of some sort. Malaga is in the middle of theirs as I write, and in The Valley fireworks (or rather very loud bangers!) go off at regular intervals to signify that, somewhere, someone is having a party. I went into one of the outskirts of Granada this morning to teach one of my private students, and on a wall outside his office there were lined up an assortment of bottles of every shape and size. These were, apparently, remnants from last night’s festivities enjoyed by the youth of Maracena as part of the area’s fería. In fact, there is so much going on in the Granada Province that it is very hard to fit even a fraction in. A Guitar Festival (we’ve just booked tickets! ), a Lorca-themed theatre festival (soon to be written about in another blog post), live music gigs in towns along the coast, another open-air theatre festival in a glorious spot in La Alpujarra, the foothills of the Sierra Nevada, in a setting modelled on Cornwall’s Minack Theatre. If I ever thought that I might miss the rich cultural diversity of London, then I was very much mistaken. This weekend, we enjoyed our own local festival. Well, it wasn’t exactly in our village, but in the neighbouring village of Albuñuelas. We have some friends who own a house in that village: Chris and Jackie. Chris is a cycling chum of Andrew’s and the pair often whizz off to far-flung corners of Granada for 3 or 4 hours at a stretch. However, over the summer months, Chris and Jackie decided to go cycling in Peru so have not been here for a couple of weeks. In their absence, Chris’s sister, Andrea, and her family have been over to stay in the Albuñuelas house, and it was suggested that Andrew show Mark (Chris’s brother-in-law) a few cycle routes. 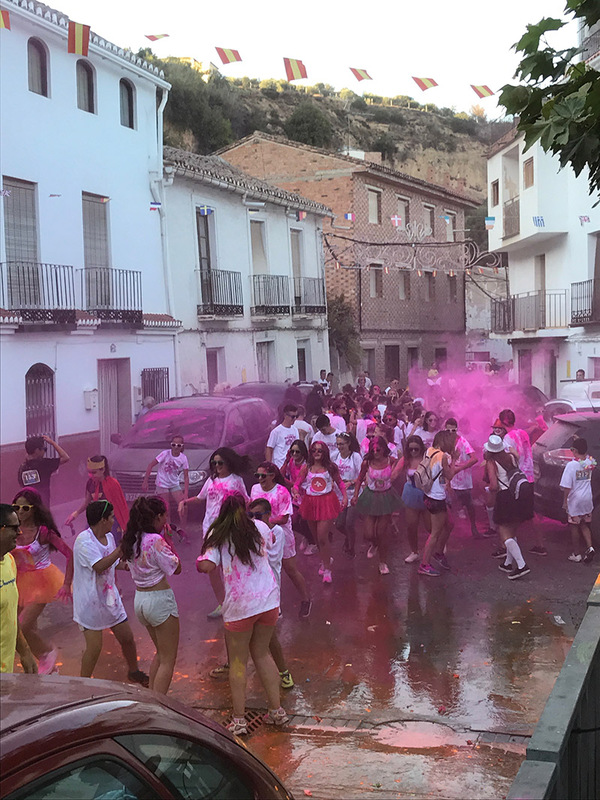 During the course of the cycling and general meet-up with Mark and Andrea, we saw that Albuñuelas was due to have a bit of a shin-dig that included a Colour Run and a sort of night-clubby rave (in the local sports hall). Given that Andrew and Mark are sporty types, the Colour Run looked rather appealing, so a plan was hatched to take part. If you have never seen or heard of a Colour Run, it is a fun run during which the participants have powder paint thrown at them until they are covered in all the colours of the rainbow. Sounds a blast! Having registered, we turned up in Albuñuelas at 7.30pm for the 8pm start of the run. I was determined to park our car (have we told you that we have bought a car?!) in a car park as far from the run route as possible, even though I was not sure where the run route was. The main square in the village was already a mass of people, many in fancy dress. The bar was doing a roaring trade, and the elders of the village were out to see what all the fuss was about. Maria Gracia, a local from our village and who cooks up some of the delicious tapas in our bar, was there, as she is very much connected with the cultural side of the local ayuntamiento activities, and is indefatigable. All participants got a T-shirt, sunglasses and bib, and prepared to compete! I have to say that it was all slightly overwhelming to begin with, as the village barely seemed able to cope with so many people, and there were signs that a fair amount of water might play a part in proceedings, and buckets of powder paint were very much in evidence. Andrew and Mark were also joined by Mark’s 13 year old son, Luca, and shortly after 8pm, the organisers signalled the start. The bulk of the runners shot off in the wrong direction, only to be turned around shortly afterwards, just as the main leaders were on their way back from one end of the village. In the chaos, handfuls of paint, and balloons filled with water were thrown at everyone and everything. The elders of the village, in their smart dresses, shuffled from one side of the square to the other in vain attempts to avoid being daubed (they were pretty successful, it has to be said). Cars parked around the square were less fortunate, and one couple came back to their own car to find it an alarming shade of day-glo pink. Clouds of fluorescent powder filled the air, and the runners disappeared through the village streets. As I later learned from Andrew, at strategic points along the route, organisers laid in wait with their buckets of colour and hoses of water to ensure that no-one escaped unpainted. After 20 minutes (they only had to run 3kms, so who knows why it took so long! ), the front-runners emerged looking bedraggled and multicoloured, not quite sure where the finish line was, staggering into onlookers who shied away for fear of being splattered with paint dripping from these valiant athletes. Mark, Andrew and Luca were near the front (they are so competitive), but no-one got a medal. This was for fun. As the village square filled with painty people, it seemed like a good idea to try and wash off the worst excesses in the fountain. It was around this time that the elders of the village thought it wise to beat a hasty retreat. The streets filled with coloured water, cars sported their new bright livery, the bars picked up the pace. We hastened down to Meson Tres Lindes, run by our friendly hostess Lola, and had a welcome handful of drinks and raciones. It was equally exhausting for me, Andrea and her daughter Carina just watching! I will let Andrew tell more about the race itself, but this was a great event. It brought the whole village together, with friends and neighbours, and the atmosphere was fantastic. Everyone is welcome, spirits are high and people just have fun. Even the couple with the bright pink car seemed unfazed, and laughed it off, drawing hearts in the thick pinkness. AW: I've run in quite a few races back in the UK. There is always a standard procedure for pre race registration. Not so here. We arrived to a mass of excited teenagers all dressed up, loud music pumping out of huge speakers and tables of locals drinking a lot of beer. At first I panicked but actually the key thing here is not to panic, do like the locals, enjoy and go to the bar and get a drink and that's what we did! After having found the registration desk and put my t-shirt on we just sat down with Mark and family and waited for instruction whilst all around us kids were throwing water bombs and more people packed into the square. Once out of the square we 'ran' a circuitous route round the village. I caught up with Mark and Luca and we just followed the crowd, not always successfully, one wrong turn when we followed some 6 yr olds but you never knew quite what was coming round the corner... SPLASH bucket of water on your head followed by a healthy dose of powder - villagers had been placed round the course with hoses and buckets of colour, you just had to laugh and enjoy it and that's what we did. One moment pink, the next blue, the next purple and up hills with plastic sheets covered with washing up liquid so you had to crawl your way up to the top whilst getting a rainbow thrown at you! The key thing was everyone was really enjoying it. We got back somehow ... a slightly different colour to when we started and within seconds we were at the bar! PHEW.